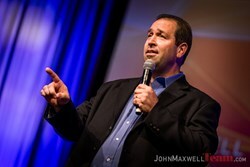 I began my journey with John Maxwell 11 years ago as a student of leadership. The principles of John's leadership has shaped my life for the better and focused my efforts towards helping others reach the next level in their personnel and professional development. Through these principles and the help of a personal mentor, I have enjoyed great success in leading teams in disaster response, training intitiatives, and strategic planning committees. Now I am fulfilling a dream in mentoring others on their own unique and meaningful journey.